The Community Leadership Fund we spoke about last month has sent out their decisions about funding. We are relieved and delighted to report that Hui E! received a significant grant, which will largely replace the funding we had been receiving from central government. So – at least for a few months – we can focus on our kaupapa – to connect, strengthen, support and promote the whole community sector. A word of warning – this time of extreme financial uncertainty has driven home to us that Hui E! itself needs a more careful conversation with the sector about how support agencies like ourselves can be supported. We are preparing a very brief survey about this – watch out for it in the next while. President Obama, at the Open Government Partnership Regional Meeting. For the full 20 July address, see: Remarks by the President at the White House Summit on Global Development. What changes are happening in central government and how do they affect us? An opportunity to share information about the big changes happening both across the whole of government, and within individual departments. Our focus will be on assessing how these changes are already impacting on our sector, and what the future might look like. A great opportunity to meet and discuss with your community sector peers. From 1:30pm to 3:30pm at the Fickling Centre, 546 Mt Albert Road, Three Kings, Auckland. This is a monthly networking opportunity for people in our sector who work on communications, fundraising and PR tasks. A self-managing group, people suggest the topics for each month, and often provide a practical case study for the group to work on. In June, we looked at awards programmes – rewards for long service compared to awards for innovation, does “awards fatigue” set in after a few years?, the importance of being clear about the purpose of each awards programme. In July, Ryan Jones from TechSoup NZ provided, via Skype, a huge amount of information about the use of databases, and document control. In August – Wednesday August 24 – we will look at advocacy – when is it important to speak out? Who do you speak to? When and how do you move into the public domain with your concerns? Where can you get help with writing media releases, making appointments with Ministers, getting on TV? If your work includes comms, and you are in a community group, the Comms2Comms network may be a good place to give and receive some peer support. Runs from 10 am to 12 noon – Community Hub, Level 4, 120 Featherston Street, Wellington. Let us know your thoughts about the value of Hui E! Hui E! is facing the same pressures as many others in the sector – not enough money to do all the things we want and need to do. Shortly, we’re sending out a very short Survey Monkey survey to assess how valuable you think Hui E! is to the sector, and asking your views about whether we can increase our income from within the sector. Keep an eye out for it, and please respond – to give our Trustees some robust information as they make decisions about the future. If you haven’t seen anything in the next two weeks, but are interested in giving your views – let us know – info@huie.org.nz. Inland Revenue is designing a new tax system. The goal is to make tax simpler, more certain and save time. The not-for-profit sector makes a huge contribution to New Zealand society. IRD acknowledge it is important organisations maximise the time they have on what they do best, and minimise the time spent on tax compliance. The Taxpayers’ Simplification Advisory Board was formed to make sure all New Zealanders could contribute their ideas to the future of the New Zealand tax system. Inland Revenue wants to hear idea about how they can make tax as simple as possible and addresses the points of pain for not-for-profit organisations. Any suggestions you would like the Advisory Board to discuss with Inland Revenue can be sent through the independent advisory board website, www.FutureTax.org.nz. Inland Revenue’s site: www.changingforyou.ird.govt.nz, released publicly on 20 June gives an idea of IRD’s plans but we would encourage you to give feedback on the independent advisory group website. By the time this Panui is published, we may know which groups and programmes have received funding support from the new Community Leadership Fund – a one year $500,000 fund announced in the 2016 Budget. The fund was set up to support national Community Sector Leadership initiatives, with a fourfold focus – sector networking and collaboration, volunteering, social enterprise and community-led development. Over 50 applications were received by the Fund, with a total asking of $4.9 million – 10 times the amount of money in the fund. The decision-making is done by the Department of Internal Affairs and the Fund is under the political leadership of Community and Voluntary Sector Minister, Jo Goodhew. Discussion of the new Fund has sparked new conversations within the sector about how best we can promote sector collaboration and leadership. A number of initiatives are being looked at – we hope we can tell you more in the coming weeks. At Hui E!, we encourage you to share your ideas about the state of the sector, and current or potential actions we can take to strengthen the sector. 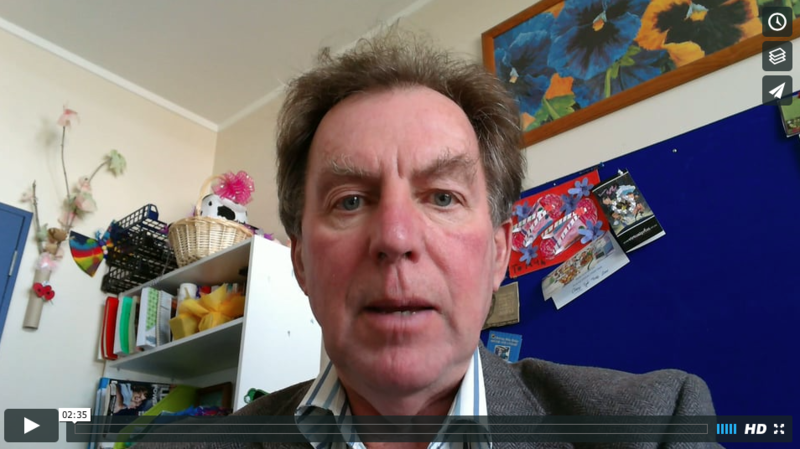 Contact us at info@huie.org.nz or phone 027 241 5152. Hui E! has brought together a group of sector leaders to develop a sector perspective on contracting and procurement. Sector groups have become increasingly concerned at the damage to our sector that results from a purely commercial, competitive approach to social procurement. We are committed to ensuring best value for public money, top quality service delivery, transparency about performance and outcomes. A reference group of sector leaders will work with an intern from Victoria University to bring together the latest thinking from New Zealand and elsewhere on this issue. If you have resources or ideas to contribute, we’d love to hear from you – info@huie.org.nz. A warm thanks to the nearly 300 groups who responded to the ComVoices State of the Sector survey. This is the second time ComVoices has taken the pulse of the sector, and the results looks depressingly similar. We have not yet done the detailed analysis, but it seems that funding concerns remain the number one item on the agenda of many community groups. A few are facing outright closure because of finances, and many others are deeply concerned about their financial future. New contracting regimes seem to have made little difference – with administrative loads remaining the same, work loads growing, and contract income stagnant. Once we have done the analysis, we will circulate the findings widely. Dave Henderson from Hui E! was sponsored by the Asian Development Bank (ADB) to attend the OGP international 2-day “Dialogue” in Manila on 21-22 July. He joined representatives from civil society and governments from countries across the region, from Armenia, Azerbaijan and Georgia to Taiwan and Australia. Also contributing were officials from the World Bank, the UN Development Programme and other global institutions. Almost all the country delegations were formed of civil society and government people working together, with a shared vision and shared goals expressed in the National Action Plan that each country has to produce under OGP. In contrast the NZ government declined the offer of ADB sponsorship to attend. “The passion we share in OGP is reform – increasing the commitment of governments to responsiveness to citizens. We may be idealistic but our collaboration (between government and civil society) makes it much more possible. “In Azerbaijan, we are working on the basis of a 5-year vision. We have a regular forum and open access – that has led to much more interaction between government and civil society organisations (CSOs). As a result government is much more aware of the value of CSOs. “Our National Action Plans are not just about bringing transparency and accountability to the machinery of government – we have commitments in health and education, and we address the lack of financial support and resources that so hampers civil society’s contribution. “It’s the People who benefit from the Open Government Partnership process – not just NGOs. The NGOs are made up of smart, cooperative people, and they can help Government at the city as well as the national level, by making OGP relevant to people. NGO people know what corruption is and can identify it, and there’s a mutual benefit.” Nina Katiskatsi, Deputy Mayor of Tbilisi, Georgia, where OGP is being trialled as a framework for building stronger city – citizen relationships. “We have to make people’s lives easier – not just build roads and the like. Openness allows people to see where to go, to help change things for the better. You can’t have partnership or even democracy without a strong civil society. 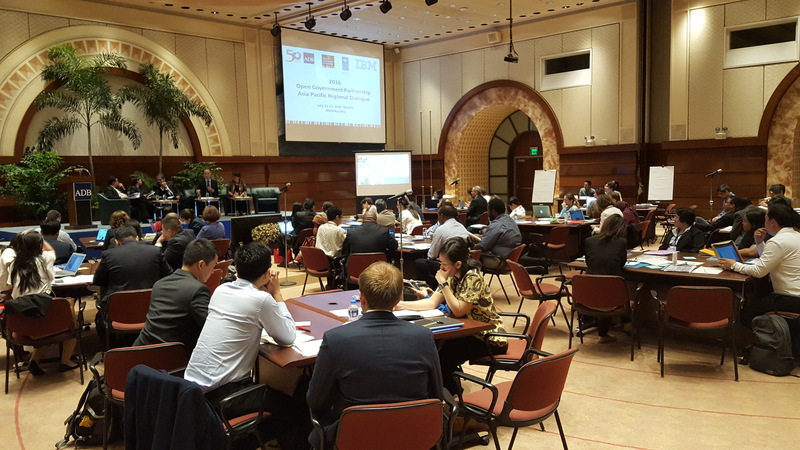 Transparency does not of itself lead to movement and change – the partnership with civil society is essential” Phil Matsheza, UN Development Programme, Bangkok Regional Hub. Dave reports that while the meeting was exciting and inspiring, with a lot of learning, he felt also a sense of frustration that the New Zealand Government had chosen not to attend, and that New Zealand was not among the countries where delegates from government and civil society organisations were working together, in mutual respect, valuing, and collaboration. “Today, we’re here to celebrate the progress that we’ve made. We’re here to keep the momentum going, guided by the new Sustainable Development Goals, including our goal to end the outrage of extreme poverty. So I may only have six months left in office, but I’m here to say that whoever the next president is, development has to remain a fundamental pillar of American foreign policy and a key part of our work to lift up lives not just overseas, but here in the United States. If you care about human dignity, if you care about reducing violence and terrorism, if you care about fighting climate change, if you care about addressing inequality and creating trade and prosperity that works for all and not just some, then you’re going to have to pay attention to development. You’re going to have to make an investment. Not-for-profits are eligible for a 50% discount with these two courses run by Victoria University. The two-day Using Data: Discovery, analysis, visualisation and decision-making course provides an overview of the modern data landscape. You will build your capacity to use data to inform your decisions and to drive your organisation’s strategies, tactics and operations as well as gaining a better understanding of how to manage and interact with people who manage data directly. Who should attend: Those who are not data people by training or disposition, but who come into contact with data as part of their jobs and want to be better equipped to use it effectively. Full details can be viewed here. Runs on Tuesday 26 & Wednesday 27 July, 9am-5pm. Price: $1224 excl GST (50% discount available to not-for-profit sector groups). The Aspire: Woman’s Leadership Development Programme recognises the differences for women in their path towards the top table. It focuses on areas most likely to hold women back and equips them with new skills and tools to address internal and external barriers head-on. Aspire enables current and potential women leaders to step into the driving seat of their leadership journey, no longer constrained by unhelpful limiting beliefs. They are then able to make deliberate explicit choices about how they want to live their lives and the difference they want to make through their leadership. Please see full details at our webpage. Starts Monday 8 August and runs over 8 half days concluding 14 November Price: $3145.50 excl GST (NGOs are able to get 50% discount on this amount). 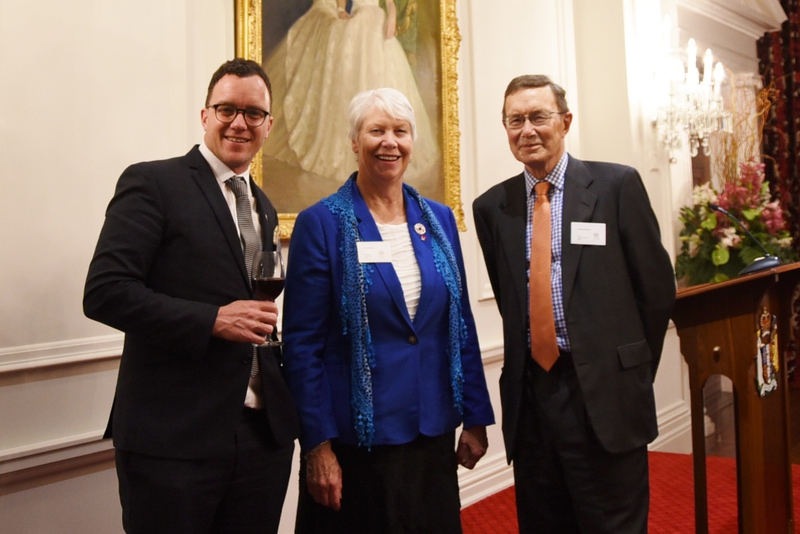 Scott Miller and Jan Harrison, CEO and Chair of Volunteering NZ, with Dave Henderson of Hui E! and Kidney Health New Zealand, at Governor General Sir Jerry Mataparae’s final event with organisations he is patron of, marking the end of his 5-year term. In early July Hui E! hosted a visit by Htet Htet Aung, a participant in the Myanmar Young leaders Program 2016, hosted in NZ by UnionAID. Htet works for PACT Global Microfinance as a finance officer, visiting field projects in many of the 57 villages they work in, giving support as well as monitoring and evaluation. Myanmar has held its first election under a new Constitution, where the Generals who had been in complete control for many years now have 25% of the seats in Parliament. This is progress towards full democracy but it remains difficult to pass progressive social or rights-oriented legislation. Civil society and community voices were very weakened under the Generals’ regime and the policy, regulation and legislative framework that is needed for a modern state to function was largely missing. Hui E! was able to share ideas about gathering community voices and conveying those, how to build relationships with MPs and Ministers, and how to help shape the legislative framework as well as links to international civil society networks. Part of the problem in establishing a strong domestic civil society is the presence of large numbers of international NGOs that have arrived since Myanmar opened up. They have their own focus, they come with international funding, big 4WD vehicles, highly educated staff and the means to rent high quality offices, but they can skew the local economy. Their presence pushes up prices beyond what locals can afford, and because they are the ‘experts’ often they are not good at listening to the locals about what is actually needed, and they often do not provide training to locals in much-needed skills such as soil testing or water management. However, the situation is evolving rapidly, and the young leaders on this programme are keen to play their part. As Htet said in an email: “It was inspirational meeting you and I learned a lot, not only the role of non-government organization in democratic system but also got inspiration from people like you. I believe that this experience will help only my career path but also for my country as well”. (Comments about developments in Myanmar are not direct quotes from Htet but are the responsibility of Hui E!, based on a range of sources). The Equality Network are continuing to work on a set of key messages relating to inequality that will form the basis of their communication over the coming year. The messaging is about seeking to achieve social change through different levels of society – community, local body, organisational and national level. The messages are non-partisan and the aim is that all those involved in the political process will develop policies that reflect those messages. The messages will be useful for your organisation’s ongoing social media, media releases and general publicity as well feeding into the debate leading up to the 2017 election. To help us develop the messages we would like member organisations to suggest key areas of concern (e.g health, housing, education or labour policy) that relate to income inequality that could be worked into the key messages. Please contact Rae Julianwith any suggestions. 54% of respondents felt the new accounting standards would not help in identifying and reporting fraud. 89% of respondents said they had not received assistance and support from Government agencies. Compliance is one of those words that sends a shiver down the spine of many people working in non-profit organisations. Changes to the rules surrounding the reporting of financial accounts for non-profits came into effect on July 1, 2015. These changes have only exemplified these feelings of dread; however, after a few deep breaths and a little time considering the changes, we can see that they can actually bring benefits. First, charities are now required by law to follow External Reporting Board (XRB) standards. The changes themselves will generally hold non-profit organisations to a higher standard of financial reporting than what they have previously been required to do. However, because of the way non-profits have been separated into four different tiers, these effects will be felt differently across the sector depending on the size of the operation. Smaller entities may well find the accounting process is now easier than before. You can find a good summation of the tiers and how the changes affect each on the RSM website. Click here to continue to read Cherie Trewevas’ article as published in Indian Newslink. .
“Working in advocacy and campaigns, we all want to influence change. But is what we’re doing really contributing to the change we want to see?” Jenny Ross at Bond, the UK equivalent of New Zealand’s Council for International Development, introduces the four simple questions that could transform your advocacy strategy and increase your impact. Watch the video. Read the whole report. The priority actions start on page 29. Only 3% believed they held too much in reserve. A resource for every community organisation the Community Law Manual is written in plain English by Community Law as a practical guide to everyday New Zealand Law to assist advocates working in the community. It provides information to assist people who have problems as a consumer with buying & selling, dealing with the legal system, family disputes & domestic violence, health & social care, housing, Māori Land, crime, employment & discrimination. See here for a full list of chapters including new subjects and revisions. The Manual costs $100 per copy for NGOs, with negotiable discounts for bulk purchases. For more information and to place your order, please email info@wclc.org.nz.